One of the most promising new areas for the commercialization of space is in the field of microgravity. Microgravity is the absense of gravity also known as weightlessness or zero gravity. It is most dramatically illustrated by astronauts floating around in their spacecrafts. Microgravity allows new materials to be developed which can not be made on Earth due to gravity. These new materials can be used to speed up future computers, reduce pollution, improve fiber optics, and enable medical break throughs to cure diseases. Comparison images provided by NASA. 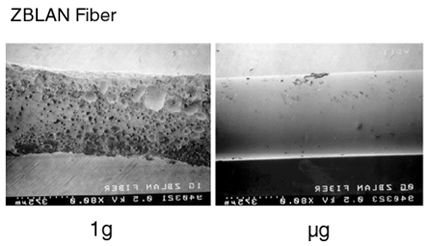 environment to stop the formation of crystallites, small crystals caused by a chemical imbalance. Scientists want to find a way to make ZBLAN an amorphous (without an internal shape) materials. Producing a material such as this will have far reaching implications on adavanced communications, medical and manufacturing technologies using lasers, and a host of other products well into the 21st century. 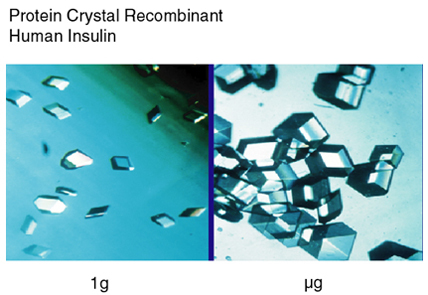 Improved crystals of human insulin will help improve treatment for diabetes and potentially creat a cure. Recombin Human insulin facilitates the incorporation of glucose into cells. In diabetics, ther is either a dercrease in or complete lack of insulin, thereby leadihng to several harmful complications.